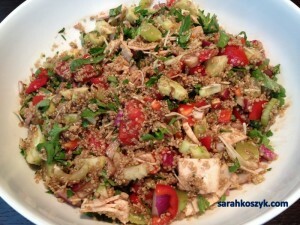 Quinoa is an amazing grain full of protein and fiber. You can make this a vegetarian salad by substituting the vegetable broth for chicken broth and substituting the turkey deli meat with tofu. This meal can be a delicious lunch or dinner. The fresh herbs bring a burst of flavor. The salad is super colorful and full of nutrients and vitamins. 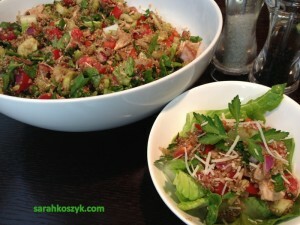 This recipe is similar to last week’s recipe of Barley Salad & Turkey Meatballs. 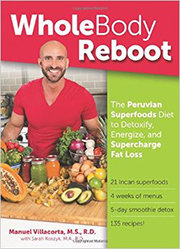 It’s to show you all that you can use many vegetables, grains, and proteins to make an amazing dish! If you don’t have quinoa, try barley, brown rice, couscous. Your options are open! Combine water and broth in a small pot. Bring to a boil. Add 1 cup quinoa. 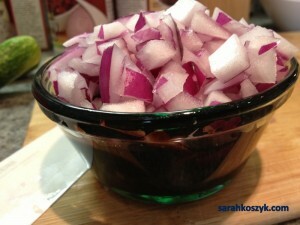 Reduce heat to medium-low, cover and simmer for about 20 minutes. 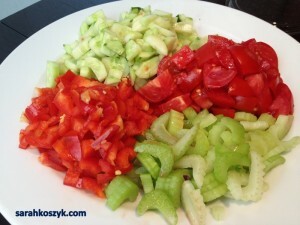 While that is cooking, finely dice red onion, cucumber, tomato, bell pepper, and celery and place in a large bowl. Add chopped lettuce, basil, and parsley to bowl. 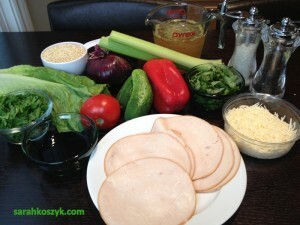 Chop deli meat into desired pieces, adding to the bowl along with the Parmesan, balsamic vinegar, and salt and pepper. 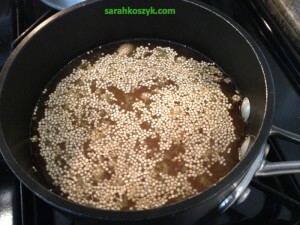 Once quinoa is cooked, pour into a different bowl, allowing to cool before adding to the vegetable mixture. If desired, allow salad to cool in fridge before serving.